The sleepy and chilled out Northern ‘city’ of Chiang Rai offers some of the best temples in Thailand including the famous White Temple, the Black House (Baandam Museum) and the modern but tranquil Blue Temple. Chiang Rai tours also include trips to the Golden Triangle, where Thailand, Laos and Myanmar meet. Above: Big Buddha Chiang Rai is not on many of the existing Chiang Rai tours but is increasing in popularity. I’d recommend a stay of at least 3-5 days in Chiang Rai. 2-3 days is doable if you book on some of the popular Chiang Rai tours. I wouldn’t recommend a day trip from Chiang Mai to Chiang Rai, it’s too far (3 hours each way). It is possible to see the White Temple, Black House and Blue Temple in one day. The following tour combines this with a trip to the highest mountain in Thailand and a visit to the Karen Hill tribes. 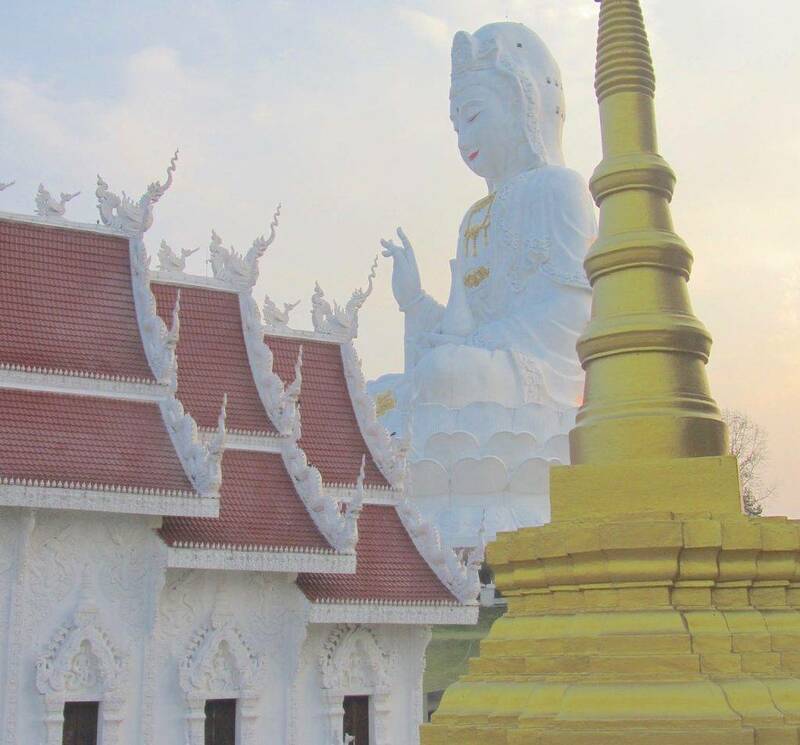 In the Chiang Rai city and temples tour, you will visit the White temple, Wat Phra Kaew (where the Emerald Buddha was discovered in 1434) and Wat Doi Tong, home to the naval pillar. It’s more easy going than the above ‘Amazing temples of Chiang Rai’ tour, as it’s just half a day (compared to 15 hours for the tour that also visits the Karen Hill Tribes). If you have very limited time and must see Chiang Rai in a day, book the Chiang Rai temples private tour. It will be a good three hours travel each way, but this tour includes lunch and a private guide. You will see all of the main temples – Wat Sang Kaew Photiyarn, Wat Rong Khun, Wat Huai Pla Kung and Wat Suea Ten (Blue Temple). The whole trip is 13 hours in total. However, it’s well worth it if you can’t spend two or three days in Chiang Rai. Looking for a Longer Trip around Chiang Rai and Chiang Mai? This four day private guided tour includes all the best temples of Chiang Rai. It adds on the best temples of Chiang Mai including the beautiful Wat Doi Suthep. Click on the image for a full itinerary.